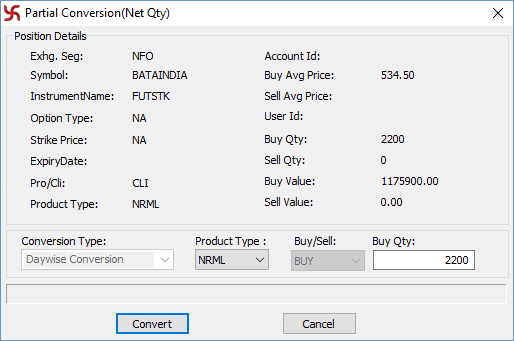 How can I convert positions on SAMCO NEST Trader? Home/Trading Platforms/SAMCO Nest Trader/How can I convert positions on SAMCO NEST Trader? Before we proceed, refer this article on what is position conversion in trading? Suppose a trader has entered an order in MIS (for intraday purposes only). However, later he wishes to convert the position into a carry forward or delivery trade. One can convert the position by completing the following steps. First go to the menu option “Masters” and select “Admin Positions” – Shortcut F11. This shall open a new window which shall display all the positions. Now, on the top right, the option “Detail” should be ticked and the “Daywise/Netwise” option should be selected as Daywise. Now, click on Get Positions to display all the open positions. Now, select the position which needs to be converted and click on position conversion. This shall open a pop up window for position conversion. In this window, select the product type in which the position needs to be converted to and enter the quantity to be converted. Please note that position conversion to NRML or CNC can be done only if the required margins are available. Conversion of CashPlus positions in NRML to CNC or vice versa can only be done on the day of the trade and not on a later date. Also, the positions can only be converted before the freeze period gets activated i.e. 5 mins before the order square off time.